ASPEN, Colorado, June 21, 2018 /PRNewswire/ — The world will face another unpredictable epidemic, but most countries are not ready to find, stop, and prevent its spread. A new website, PreventEpidemics.org, spotlights gaps in preparedness and highlights actions countries, donors, activists, and organizations can take to fill them. An infectious disease can spread from one community to any country in the world in just 36 hours, but as PreventEpidemics.org shows, most countries have not yet taken the steps needed to prepare for this risk. The website is being presented tomorrow at the annual Aspen Ideas Spotlight Health Festival by Dr. Tom Frieden, former US CDC Director and now President and CEO of Resolve to Save Lives, an initiative of the global health organization Vital Strategies, and Amanda McClelland, RN, MPH, its Senior Vice President, who coordinated frontline Ebola response during the 2014 Ebola epidemic. The website is the first to provide advocacy tools based on each country’s progress towards epidemic preparedness, and a single score that displays how prepared countries are to find, stop and prevent epidemics. Resolve to Save Lives partners with countries to help step up preparedness, especially in four critical areas: strengthening disease tracking systems, training and staffing epidemiologists, supporting laboratory networks, and developing effective rapid response teams. A key feature of PreventEpidemics.org is the ReadyScore, a measure of country preparedness based on existing data from the Joint External Evaluation (JEE), an external assessment developed by the World Health Organization and partner organizations to help countries find and close gaps in epidemic preparedness. ReadyScore uses JEE data to calculate a numerical score – from 0 to 100 – representing a country’s ability to prepare for and respond to an epidemic. Resolve to Save Lives considers countries with a ReadyScore above 80 as better prepared for an epidemic, countries between 40 and 79 have work to do, and countries 39 and below are not ready. These scores can drive action at the country and global level by motivating countries to go up a step in preparedness, overall and by specific area. PreventEpidemics.org provides advocacy tools, including detailed global and country-level data, highlights of country preparedness strengths and gaps, and action plans to engage with decision makers to improve epidemic preparedness. Advancing toward a world safe from epidemics is central to the new WHO general programme of work, which was approved at the 2018 World Health Assembly. One of three strategic priorities for 2019-2023 is ensuring that at least one billion more people are safer from health emergencies, including infectious disease outbreaks. A Joint External Evaluation is a voluntary assessment initiated at the request of countries and conducted first by a team of domestic experts and then validated by a team of independent international experts. The evaluation assesses and rates capacity in 19 preparedness areas, such as whether countries have effective disease surveillance systems, laboratories, communications mechanisms and coordination centers. The JEE is one of four components of the IHR Monitoring and Evaluation Framework (JEE, Annual Reporting, After Action Review and Simulation Exercises). Of the 65 countries that have conducted a Joint External Evaluation and released results, only nine countries (14%) scored over 80 in epidemic preparedness to address health threats, indicating better prepared public health systems, but all still have gaps and effort is needed to improve and sustain their capacity. Fifty-six (86%) scored lower than 80, which means they have considerable gaps to fill to ensure their people are safer from infectious disease, chemical and radiologic threats. The ReadyScore recognizes that no country will ever be completely safe from the threat of epidemics, however, strong and robust systems to find and stop threats can minimize preventable illness and death in the event of new or emerging infectious diseases. An additional 21 countries, out of a total of 194 countries, have either requested or started a Joint External Evaluation. The rest are either using different metrics to evaluate their capacities to prevent, detect and respond to public health emergencies and have not published the results or are not yet engaged in assessing capacities for health emergencies. 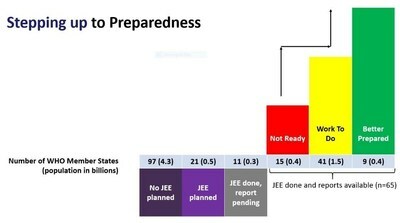 The ReadyScore consolidates 19 areas of epidemic preparedness assessed during a JEE. Within those areas, nearly 50 factors are assessed, such as whether a country has a national laboratory system to diagnose diseases, and what is the capacity of its public health workforce to find, stop and prevent epidemics. The JEE rates each of the indicators on a scale of 1 – 5. One, is “no capacity” and is coded red. Two and three indicate the “need to build capacity” (limited or developed capacity) and are coded yellow. Four and five indicate “sustainable capacity” and are in the desired green band. The ReadyScore is the average score of the nineteen area scores, placed on a scale of 0 to 100. Vital Strategies is a global health organization that seeks to accelerate progress on the world’s most pressing health problems. The Vital Strategies team combines evidence-based strategies with innovation to help develop and implement sound public health policies, manage programs efficiently, strengthen data systems, conduct research, and design strategic communication campaigns for policy and behavior change. To find out more, visit www.vitalstrategies.org or Twitter @VitalStrat. For further information or to arrange an interview with a Resolve to Save Lives expert, please contact Erin Sykes at +1 646-612-0001 or esykes@resolvetosavelives.org or Christina Honeysett, Vital Strategies at +1 914.424.3356 or choneysett@vitalstrategies.org.